My son was inconsolable when it came to dog walk time, because he had a hurty toe. What to wear into the forest? His trainers would pinch, and I forbade his new sandals. Because it’s muddy out there, right now. The heavens have tipped unbelievable amounts of rain on an incredulous English population. We are all hot under the collar about it, but there is absolutely no-one to whom we can complain in triplicate. In the forest, the soil has had enough, thank you very much. Peat has become mire. Purchasing sandals, it seems, was a foolhardy course of action. What a good thing there was a roomy pair of bottle green wellies waiting for Felix in the porch. He popped them on to reveal they protected the toe, and were a passport to all the best puddles. Felix might as well have had seven league boots on. 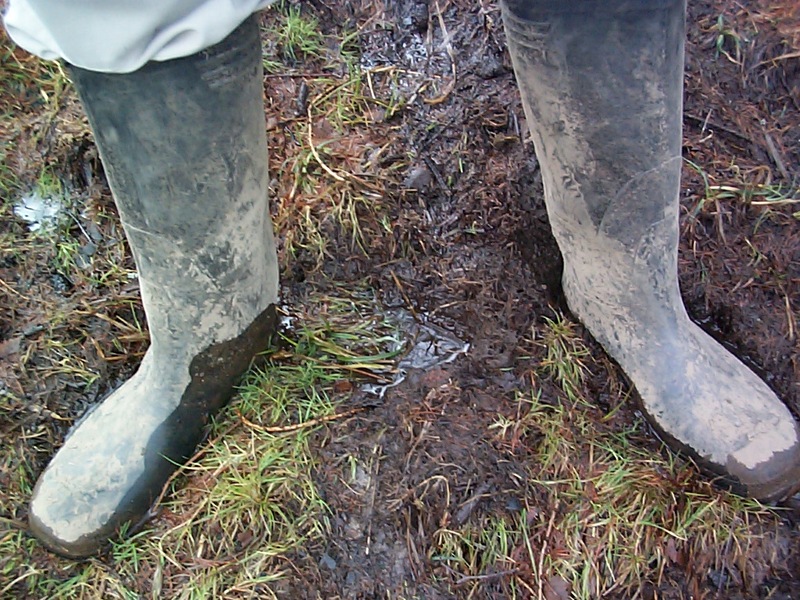 He requested the muddiest route and investigated every quaggy mire with the application of a professional surveyor. He sought out broad puddles, deep puddles, sticky puddles and shallow clear pools. He contrived to become stuck, grinning like a delighted orangutan and elongating the drama as his concerned parents asked him: did he need towing out? He sloshed and sploshed and diced with welly levels, daring the puddles higher and higher, every further towards the top of his boots. It is easy to forget that, while wellies have become the staple of children and women on relentless soggy British days out, they began as an unmistakably blokey thing. We all know who designed them: Arthur Wellesley, 1st Duke of Wellington. He had long admired the boots worn by the Hessian soldiers, the 18th century German mercinaries who often worked for the British Empire. He wanted something softer, more close fitting, but which could be used one minute on the battlefield and the next at dinner that evening. How very British. Keep calm and carry on, and all that. But Wellington didn’t make the boot. At the top of St James Street, on the corner of Picadilly, next to the old Guards Club, there once stood a stood a renowned bootmaker’s. It belonged to George Hoby, bootmaker to the stars; or at least, to the great and good of his time. His boots were the best. There was no disputing it. But according to celebrated diarist Captain Rees Howell Gronow,his manners were famed for being arrogant and irascible. One day, as he was with the Duke of Kent fitting him for boots, someone brought news that Wellington had trounced the French at Vittoria. Magic boots. Seven-league boots: Hoby died leaving a fortune of £120,000, and his legacy has outshone the fortune by far. It stretches throughout English life,through all our rainy days. All the way to a rainy forest puddle, where a small boy plays at adventures. Who knows where Hoby’s boots will carry him. Posted in Quirks of History, Shrewsday MansionsTagged Bootmaker's, Duke of Wellington, Hoby, wellies, wellingtons, wet weatherBookmark the permalink. I long ago gave up on designer wellies, Sidey: though I have a pair of ankle length ones which I can slip on for squelchy walks with the dog. What a wonderful post. I knew of Lobbs but I did not know of Hoby. I love his retort to Churchill. It is classic, isn’t it, Roger? kids and puddles, who can separate them and then wellies come handy. Another interesting piece. I have long known that nothing makes a child happier than a pair of wellies and a monster puddle. And thank god for it, Tilly! Otherwise wet days would be a cabin-fever disaster! Puddles are a boy’s 2nd best friend. 😀 Indeed. And a dog’s. I miss my wellies. They developed a hole in the foot, something Hoby’s would’ve been immune to, most likely. The rubber ones do tend to split, Andra; though I bet Hoby’s was not as impermeable to moisture generally as these are. Necessity dictates that we wear them regularly here. I think we may have to begin building an ark fairly soon, Karen. Those wax coats are great, MJ. Worn long enough you feel like Theo from The Matrix, standing there dripping in British rain. What’s interesting about classic items like these is their reinvention for new times and their adaptation for new uses. As well as designer wellies, and the upper class resonance of green wellies, I think of that phrase from the 1990s, “Give it some welly!” (well, I know what it signifies, but why a welly?) and that spurious ‘tradition’, the Throwing the Welly competition (through the legs and backwards I seem to remember). Even its familiar abbreviation speaks of affection, so I’m looking forward to future variations on the theme. We have learnt to love them, just as we are flanked by out brollies, Chris. Here’s to future welly/brolly diversification…..
Wellies make you feel invincible! They do, Robin. Makes you want to put a pair on right away, doesn’t it? My daughter has a darling pink plaid pair. Oh to need an excuse to wear them! Oh, to live where they weren’t needed…bucketing down outside as I type…. Puddles are in cahoots(conspiracy) with Satan. They have magnetic power to draw young children right to them and have the children slosh around in the deepest part of the puddle. Especially when they are wearing their very best “Sunday” shoes. I know! It’s almost as if kids WANT to squelch soggily home….do you get much rain there? We do love our rainboots, too, though we’ve had quite the opposite stretch of weather. While they’re not actual Wellies, they are quite the thing for puddle-jumping. Just googled the rain boot, Cameron. They look like very stylish wellies. Hoby would surely approve. If the English are incredulous towards their rain, Canadians are incredulous to long winters of snow, sleet and wind. I wonder with Olympics not long to get underway, if the 50 metre Wellie dash will be new event. Funny until the other day I didn’t know what Wellies were. With global warming creating strange weather patterns Wellies may in vogue. They can be really stylish, Tandy. I like to be able to forget they are on my feet and do what I want, though. Jumping in puddle in South Africa. Must put that on my bucket list. That is quite true, BB. And do you find they walk your socks right out of the boot?